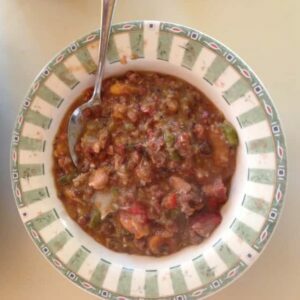 Have you ever read Stone Soup by Marcia Brown (1947)? It has been a favorite in our home. 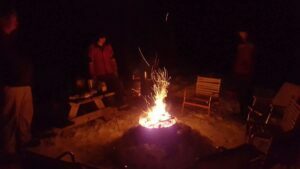 Recently we invited some friends to join us for an Almost Full Moon Snowshoe Outing and Stone Soup Dinner. Say that three times fast! Make sure you read the book, but a quick summary is a village is struggling to make it through the winter with meager food staples. To help each other survive, everyone gathers and puts what they can into a huge soup pot. The village is saved and everyone is fed. There are other lessons as well in this wonderful story. Winters in Maine can be long. I like to find ways to liven it up which helps me and others get through. I’ve been doing quite a bit of snowshoeing, and we have made many trails around our property. 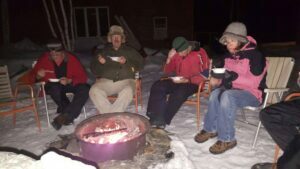 Based on Stone Soup, inviting neighbors to snowshoe in the moonlight and enjoy a meal together seemed like a great idea! Our gathering time was 5 p.m. At 4:15 p.m. the sky was cloudy and our fires were struggling to start. It was looking to be a disappointing event. However, persistence paid off. 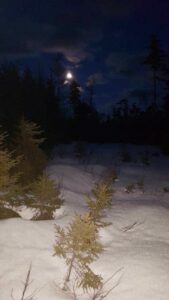 Our fires flamed and as our group of 20 or so snowshoed into a clearing near our home, the clouds parted and the moon showed herself! Before anyone thinks we are irresponsible with fire, two of our group stayed to tend the fires and stir the soup pot. This was an amazing dish! Words of caution: my family’s ingredients were fully cooked. Some of our guests brought uncooked meats and veggies. Make sure you allow time to fully cook everything! Please share your photos and ingredients list! !